Counterprotesters tear a Nazi flag, Aug. 4, 2018 in Portland, Ore. Small scuffles broke out as police dispersed hundreds of right-wing and self-described anti-fascist protesters. 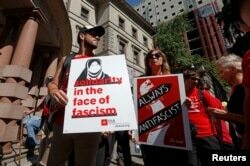 Small scuffles broke out Saturday as police in Portland, Oregon, deployed "flash bang'' devices and other means to disperse hundreds of right-wing and self-described anti-fascist protesters. "Get out of the street,'' police announced via loudspeaker. There were arrests, but it wasn't immediately clear how many. There was also debris left in the streets by various protesters. Members of the right-wing Patriot Prayer group gather before a rally in Portland, Ore., Aug. 4, 2018. Demonstrators aligned with Patriot Prayer and an affiliated group, the Proud Boys, gathered around midday in a riverfront park. The counterprotesters were made up of a coalition of labor unions, immigrant rights advocates, democratic socialists and other groups. They included people dressed as clowns and a brass band blaring music. The rally organized by Patriot Prayer leader Joey Gibson was the third to roil Portland this summer. Two previous events ended in bloody fistfights and riots, and one counterprotester was sent to the hospital with a skull fracture. This time, Gibson changed the venue from a federal plaza outside U.S. District Court to a waterfront park so some of his Oregon supporters could carry concealed weapons as they demonstrated. Protesters saw a significant police presence that included bomb-sniffing dogs and weapons-screening checkpoints. In a statement, police said weapons might be seized if there was a violation of law and added that it is illegal in Portland to carry a loaded firearm in public unless a person has a valid Oregon concealed-handgun license. Many protesters were expected to be from out of state. Gibson's insistence on bringing his supporters repeatedly to this politically liberal city has crystallized a debate about the limits of free speech in an era of stark political division. 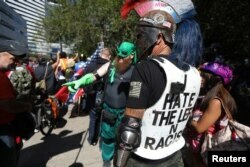 Patriot Prayer also has held rallies in many other cities around the U.S. West, including Berkeley, California, that have drawn violent reactions. 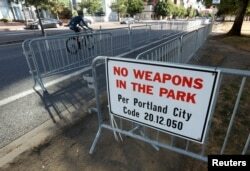 A "No Weapons" sign is seen at a park where the right-wing Patriot Prayer group planned to rally in Portland, Ore., Aug. 4, 2018. A coalition of community organizations and a group representing more than 50 tribes warned of the potential for even greater violence than in previous rallies if participants carried guns. The coalition called on officials to denounce what it called "the racist and sexist violence" of Patriot Prayer and protect the city. Gibson, who is running a long-shot campaign to unseat Democratic U.S. Senator Maria Cantwell of Washington state, said in a live video on Facebook earlier this week that he wouldn't stop bringing his followers to Portland until they could express their right-wing views without interference. "I refuse to do what Portland wants me to do, because what Portland wants me to do is to shut up and never show up again. So, yeah, I refuse to do that, but I will not stop going in, and I will not stop pushing, and I will not stop marching until the people of Portland realize that and realize that their methods do not work,'' he said. Self-described anti-fascists, or "antifa," have been organizing anonymously online to confront Patriot Prayer and the Proud Boys in the streets. Protesters gather before a rally by the right-wing Patriot Prayer group in Portland, Ore., Aug. 4, 2018. A broader counterprotest organized by a coalition of labor unions, immigrant rights groups and artists planned to gather at City Hall before the Patriot Prayer rally. Organizers say that while Patriot Prayer denies being a white supremacist group, it affiliates itself with known white supremacists, white nationalists and neo-Nazi gangs.